Home : General Articles : Articles : SID MALLYA fuels some IPL T20 passion! SID MALLYA fuels some IPL T20 passion! The IPL season is here and with it has come the crazy cricket devotion of millions of people all over. The suave Sid Mallya being one such ardent follower and an avid sports enthusiast himself, is also caught up in the increasing IPL fever, showing support. 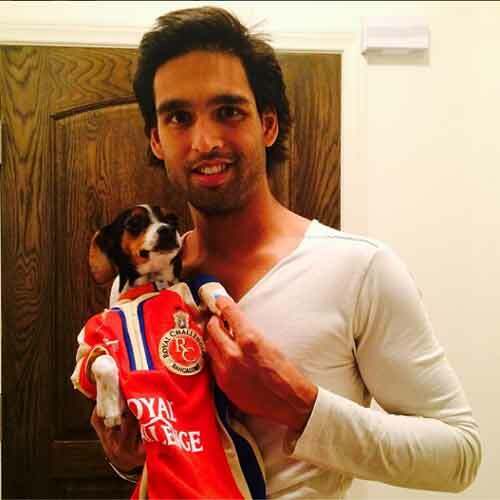 He recently posted a picture on Instagram of him holding his dog Duke wearing the RCB jersey. Extending his support towards the popular tournament, Sid tweeted, "Looking forward to the start of the #IPL ..wish all our boys at #RCB all the best...duke is dressed for the occasion!!". Apart from being an enthusiastic spectator at matches, Sid visited the â€˜Happy Home and School for the Blind' last year accompanying Chris Gayle, the opening batsman at RCB. Him and Chris had fun playing Cricket with the Kids there. IPL is one of the most watched T20 cricket leagues in the world. Since it's inception in 2008, it is an annual affair that happens during April-June. With about 8 teams fighting for the top spot, it has certainly become a phenomena that has taken over the world. Despite being overseas, Sid continues to keep in touch with cricket in every way possible. Even though he wouldn't be present at the matches this year, his heart surely belongs here.